Congratulations to Pigeon_Magnet_Tas for his design and thanks to everyone who submitted entries. Were still open to other designs and if you send us one we release, well send you one! 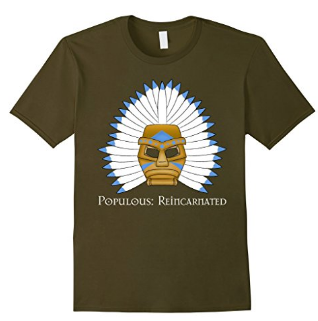 We also have a second design created by KingOfSpies featuring the shaman. T-Shirts are available for $23.99 at the PopRe CafePress Store which ships across the world. We also have a limited selection available to US customers only (sorry others!) at Amazon for only $10.99: FireWarrior at Amazon and Shaman at Amazon. 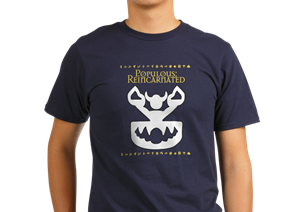 Have you ever wanted Populous: Reincarnated T-Shirts or maybe some sort of Populous related art work on a Shirt? Well nows the time! We will be holding a contest this month. The winner // winners will receive two free T-Shirts & tagged in the announcement for the winner here and on PopRe Facebook along with there artwork! In your e-mail put your name & email address and attached artwork. There can be more then one winner. Show your love for the game and submit! All images and map files on this site are © 2016 Populous: Reincarnated.